One of Bangalore’s leading property developers, the Concorde Group, was launching a new project, Concorde Spring Meadows, on Hesaraghatta Main Road. Having made their mark all over South Bangalore, the group was now looking to enter the property market in North-West Bangalore and make a strong impression. Given that the Concorde Group was entering a new geographical market, we wanted to launch a campaign that would have strong visibility to create maximum impact. We analyzed the housing needs of the area as well as the target audience in mind. After all the research and brainstorming, we came up with a campaign titled, ‘Live Between’. The communication focus was to position Spring Meadows as the archetype of a well-balanced life since the biggest challenge people in a city like Bengaluru face is juggling the different elements that make up their lives. The campaign finally took off with a series of outdoor ads. 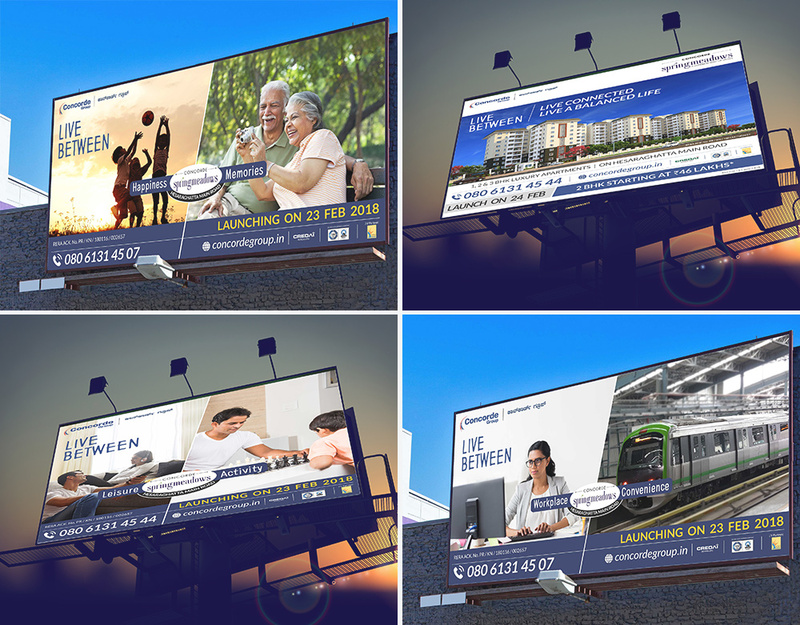 The campaign gained significant visibility for Spring Meadows and helped draw in a lot of footfalls for the launch of the project. High sales volume was registered on the opening day itself and lead generation continued to draw in good numbers. The most crucial aspect is the fact that the target audience was able to clearly relate to the campaign communication line.